Lindal North America, Columbus, IN, specializes in the production of valves, actuators, spray caps, and overcaps for a range of consumer products. At its Columbus plant, Lindal manufactures closure parts on multiple presses. 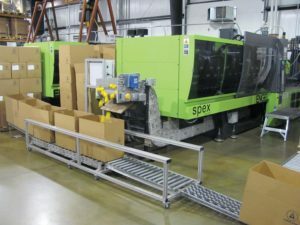 The company had been dropping prepared parts into corrugated boxes via chutes on the molding machines. “We were manually changing boxes as they were filled and had to do a weigh-check on each box, using a variety of check weighing machines. If we didn’t manually move a box off the line fast enough, parts would back up into the chute and the drop zone. Production got clogged, resulting in downtime” said Jay Bray, Lindal molding engineer. Bray learned about modular “DynaCon” box filling systems and the start-stop flexibility and reliability of the DynaCon conveyors. Dynamic Conveyor sent a representative to the plant to assess Lindal’s parts handling equipment requirements. After discussions, Lindal North America installed DynaCon indexing conveyors with quick stop-start and reverse-drive capabilities.